2019 Graduation is at Pinnacle Bank Arena, Sunday, May 26, 6 p.m. No tickets are required for family and friends. Seating is on a first come first serve basis. 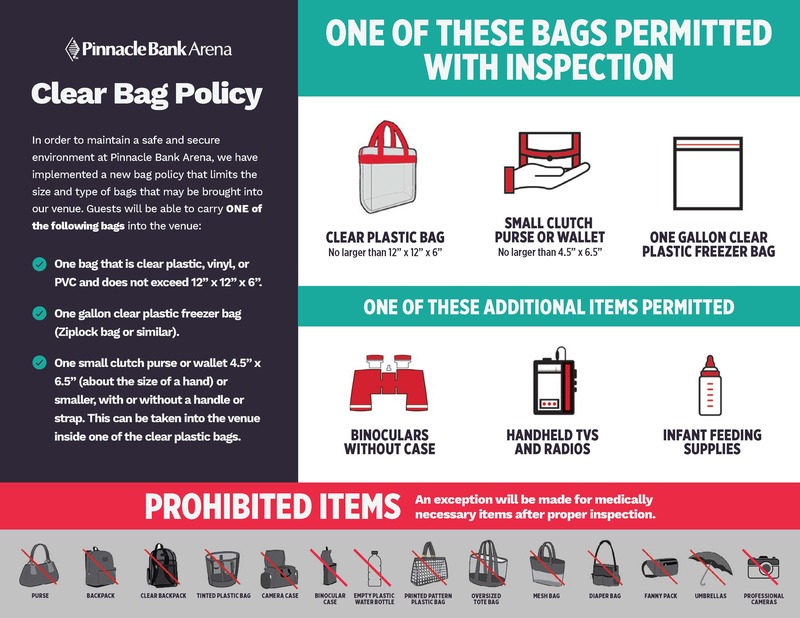 Please note that we are required to follow Pinnacle Bank Arena's clear bag policy. A letter will be sent to all potential senior graduates with information about graduation, senior breakfasts, and senior honors. Be watching for this letter the end of April/beginning of May. Seniors interested in speaking at commencement can pick up a form in the main office after spring break. Deadline to submit an application is Monday, April 15. Caps and gowns will be delivered to school in May and will be distributed to students after the senior meeting on Tuesday, May 14th. Make sure your student attends this meeting! Seniors should monitor their lunch account balance. If a refund is needed on their account, they need to contact the cafeteria prior to May 22nd. Any balance left in their lunch account is absorbed by Nutrition Services. Immunization records for graduating students will be placed in their graduation packets. Please keep them in a safe place for future reference. It is also recommended that senior parents and seniors go into ParentVue or StudentVue and print several copies of their immunizations before graduation as seniors will need this for future use...college admission, employment, etc. Once seniors graduate they will not be able to print their immunizations. Students attending the LSW graduation ceremony will receive a blank diploma cover when walking across the stage. Providing all requirements have been met, the diploma itself will be given to them in a white packet AFTER the ceremony in the area where they waited prior to entering the ceremony. Students attending summer school will receive their diploma upon successful completion of summer school. Only 1 diploma is given to the graduate and cannot be duplicated. If the diploma is lost, the grad can request a Final Transcript which will have the graduation date listed. All LPS 2019 graduate’s diplomas will list May 23, 2019, the last day of school, as the graduation date. A Final Transcript is a transcript that has a student’s date of graduation listed. The student must request a Final Transcript be sent to the institution they will be attending. Sending a transcript to a college during a student’s final year that does not have a grad date does not fulfill the college’s requirement of a Final Transcript. Many colleges will put a hold on future registration and/or financial aid if they do not receive a Final Transcript. Athletes are also reminded to request a Final Transcript for NCAA or NAIA—they, too, require a Final Transcript. If you are graduating early as a JUNIOR, please let Brianne Wright, bwright2@lps.org (main office) know if you would rather be honored at the LSW Honors Convocation with the junior class, or if you would rather be honored at the Senior Honors Program.